MADE WITH CERTIFIED ORGANIC INGREDIENTS IN THE USA: Certified Organic Castor Bean Seed Oil, Certified Organic Beeswax, Certified Organic Sunflower Seed Oil, Certified Organic Coconut Oil and Vitamin E (non-GMO). Nothing else added. NO HARMFUL CHEMICALS, NON-TOXIC, NON-GMO: No synthetic flavoring, no toxic chemicals, no petroleum, no SLS, SLES, PG or PG derivatives. No soy, no corn, no gluten, no chemical fillers or synthetic fragrance. Just 100% safe goodness for your lips. All Christina Moss Naturals products come with a 100% Satisfaction, Money Back Guarantee. THE BEST LIP BALM TO USE FOR ADULTS, KIDS AND BABIES: Our safe and effective pure formula that our customers have loved for years. If you use ChapStick, Burts Bees, Carmex or Maybelline, give ours a try. We guarantee you wont be disappointed. Our lip therapy works very well on people with even the most sensitive lips. Great to include in gift sets. EFFECTIVE LIP CARE TREATMENT: Our chap stick lip butter will moisturize, cure, energize and soothe your lips, protecting them from becoming dry, chapped, cracked or weathered. Perfect for dry climates, sun, snow or cold weather. Also works very well as a base coat or primer for lip liner or lipstick as part of your makeup routine, leaving your lips nice and smooth. CRUELTY FREE, ECO-FRIENDLY: All of our products are cruelty free (never tested on animals) and our packaging is made from recycled materials that is 100% recyclable once you are done with it. We use tubes that are made using 30% less plastic than regular lip balm tubes. If you are reading this, then you are probably searching for the perfect lip balm. Wed like to help you end that search here and now. If you want to have smooth, moisturized lips that will not crack or chap, this is the lip balm for you. Like most people today, you probably dont want to have nasty, harmful, toxic chemicals going into your body from the food and water that you eat and drink. This applies to putting toxic chemicals ON your body too, since they get absorbed directly into your blood stream (courtesy of your skin care products). So dont put toxic chemicals on your lips either. 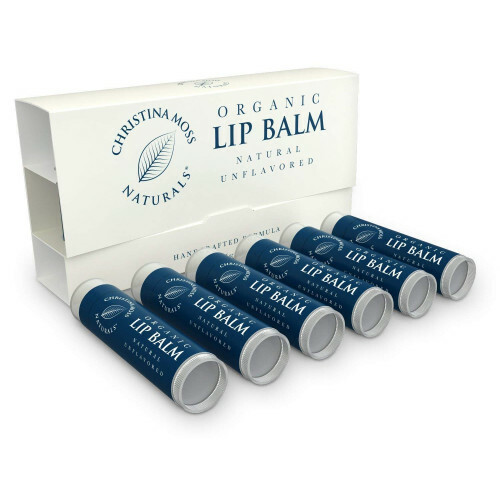 Our Organic Lip Balm is made using Certified Organic Ingredients that are safe for the entire family, made only from the best and most pure ingredients. We offer a 100% Satisfaction Money Back Guarantee on all Christina Moss Naturals products. That's our promise to you, so you can buy with confidence and without risk. 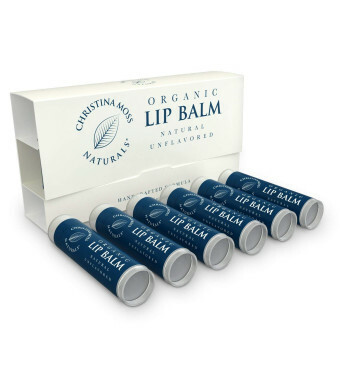 So, add our organic Lip Balm to your Cart now. You'll be happy you did, we guarantee it! Give your lips the love and care they need. They will thank you. And while you are at it, pick up a few extra for your family and friends. These cute little packs make great gifts.